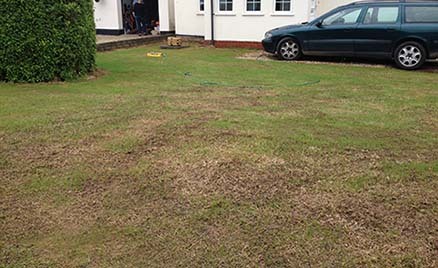 If your lawn is uneven, full of coarse grasses, moss, weeds or bare patches then a full renovation is a great solution. Your old lawn is treated to kill existing weeds and moss but not the grass. It is then scarified to remove thatch and moss and aerated using hollow or solid tines according to conditions. A seeding fertiliser is applied. A professional seed slotter is used to insert Barenbrug seed at the correct depth and density. Finally we apply a top dressing of sand and loam. This method is used when the existing grasses are not suitable. We apply a moss killer and a total contact herbicide which kills grasses and weeds. We then aerate, scarify and prepare the surface for seeding. Using a professional seed slotter we then seed the lawn at the correct depth and density. 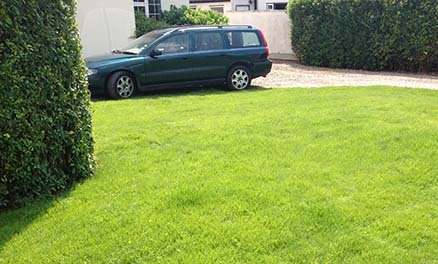 We use quality Barenbrug seed suited to the lawn environment. Then we apply a sand and loam top dressing to cover the seed. It is important to water the newly seeded lawn regularly each day to ensure a good germination and growth of the new grass plants. Eight weeks later you will have new fresh grass and the start of a brilliant lawn.